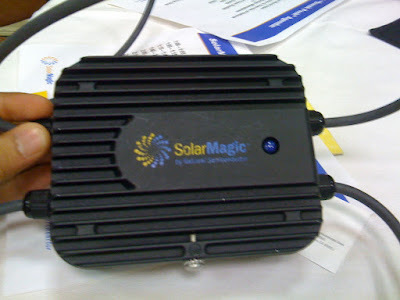 Have you heard of SolarMagic by National Semiconductor? The “power optimizer” is a new type of device that is gaining popularity in the solar photovoltaic market. Solar panels wired in strings on a central inverter are only as good as their weakest link. For example, if part of a solar panel was shaded due to a chimney, the entire string would lose its ability to harvest the maximum power. With SolarMagic you can “assist” a string for each solar panel to reach it’s MPPT (maximum power point tracking) in which you will harvest the most electricity possible. SolarMagic can also prevent power loss from panel-to-panel mismatch, different panel orientations and tilts, or different string lengths. Mismatches on a string of solar panels are the culprits of power loss and installers minimize mismatches by reducing the size of the solar array to avoid shade, accepting a lower energy output per square foot, or adds extra solar panels in a different part of the solar array, all options either cost money, depreciate efficiency, and lose aesthetic appeal for the system owner. SolarMagic units are used on conjunction of a blocking Diode. You need one SolarMagic unit per solar panel on the string that you want to “assist”. What do you think about SolarMagic?